Too often young goalies and their parents place too much emphasis on what happens in games. But when was the last time in school you failed your homework assignment but remained confident that you would ace a test? For parents, it’s the equivalent of calling in sick every day at work but still hoping to land a big promotion. The fact of the matter is practices should become your new game. A coach’s job is to develop his or her players. This does not happen in games. What you do, however, in practices will carry over to games and can help you be more successful. Ever notice how much you or a friend improves with a week of hockey camp? In that type of an environment you are doing drills based on repetition and habits. Since the ice times are goalie focused, it’s the equivalent of a full season worth of practice. Why not take those skills learned at camp and apply them to every practice during the season? Let’s take a look at some key habits of top goalies and identify their practice habits. Keep in mind only you, the goalie, can do these. No coach can stand there and make you perform them. Habits are what separate the best from those sitting on the bench. Good habits start before you hit the ice. Eating properly is important, especially on days when you have ice times. Do you have a favorite stretching routine for games? Make sure you are doing that same routine before practices, too. When you hit the ice, there are habits that goalies need to address. First and foremost, always follow the puck. Too often young goalies move their head and watch the puck but their body is frozen. A goalie needs to track the puck with the center of his body at all times so he is best prepared for the shot. The key to this habit is what happens after the shot, the rebound. When giving up a rebound it’s key for the goalie to track the puck, again with his body and not just his eyes, and follow the rebound. This one simple habit can help prevent a lot of goals from happening. 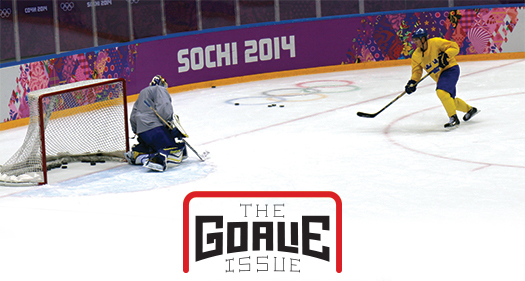 It’s common for a goalie in practice to see more than a hundred shots. Imagine if you followed the rebound on every shot for a week. It becomes pretty easy to do it 20 to 30 times in a game. Don’t worry about the next shooter in the drill, you need to develop yourself and follow the first shot's rebound. Get in a rhythm and establish timing in the drills. Another key habit for practices is to work on your recovery. In today’s goaltending too often goalies slide into the post for a jam play or drop into a butterfly and just sit there. You will notice a young goalie’s body slowly begins to lower itself to the ice as he becomes fatigued. A goalie should only be down for a three count before attempting to recover to his feet. If he stays down too long in one spot the puck carriers find options and create other opportunities. Don’t get caught sitting. You will always move quicker on your feet than sliding. Habits are what separate the best from those sitting on the bench. Remember you are a key part of the team. You also have the best seat in the house and can see the entire ice whereas your teammates might have their concentration alone on the puck. Most goalies in the NHL are very vocal, sometimes so much you can hear them on your television. You are essentially a quarterback and need to call out to your teammates. Let them know you have the puck carrier, tell them if they have someone close to them trying to take the puck, or direct them to your open wingers for breakouts. Also, most importantly, let them know if you can see or not. Many times your defensemen are so focused on the puck carrier they do not know they are blocking your vision of the puck. Make sure you are going out of your way to tell them. Finally, the most important habit is to always battle. You need to try on every single shot. Get hungry for the puck and work on placing rebounds where you want them. Move fiercely through your crease to cover any puck that you can reach. Imagine if you gave 100 percent on every single shot? Your teammates would see that and they would begin to practice harder. As a unified team, come game time, no one would stand a chance against you. And most importantly since your practices are full of good habits, your games will come easier and you will have more fun. After all, that’s why you signed up for the position. Jason Power is a Level 5 coach who is a Missouri Player Development committee.